Dylon Crain (above, partially hidden), Nicholas Ward (at the helm), Ian Hosack, Matthew Peckham in Intoxication: America’s Love Affair with Oil. Photo courtesy of Thompson Street Opera Company. 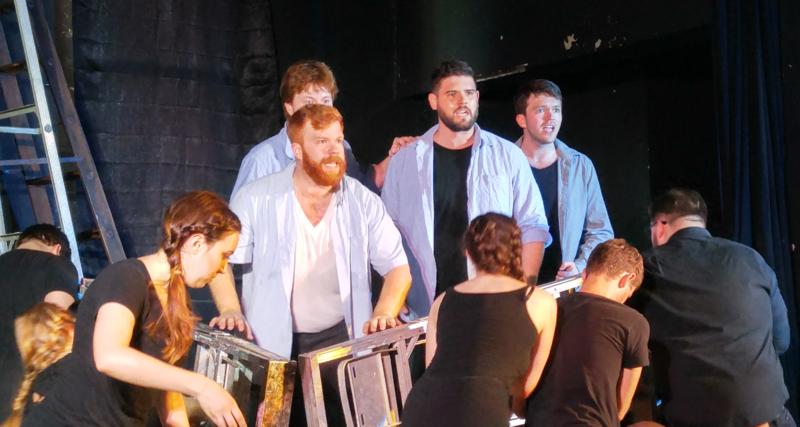 Thompson Street Opera Company’s mission is to produce and perform pieces by living composers, such is the case with the final Louisville performance of their all-too-brief summer season: Intoxication: America’s Love Affair with Oil. The overt political perspective seems to have a lot of truth to back it up. Kudos go to Ben Allen-Kingsland and his associates for their due diligence in researching the facts as it pertains to our love, want, and need for fossil fuels. The beginning starts innocently, with a lovely dancer representing a younger United States, as the chorus, dressed all in black, stands in the background. The dancer pantomimes digging and soon another dancer emerges from the stage bubbling and swishing about like crude oil rising from the earth. After they exit the story proper begins, with the use of ladders serving as oil rigs and the chorus singing about the toils of the hard labor they are enduring at Spindletop, TX. Peter Morgan’s lush and vibrant bass gives voice to the character of Anthony Lucas, who insists that the Black Gold will be found and, as we know, it is indeed. The opera takes the audience from the late 19th Century through present day, focusing on the milestones associated with the growth of Big Oil: industry, automobiles, war, poverty, wealth, and environmental hazards. A slideshow projected on a side wall illuminates and corresponds to what the chorus and soloists are singing about throughout the performance, such as pictures of early oil production, Henry Ford’s Tin Lizzie, and even images that are reminiscent silent movies. The dance duo (Emma Richmond and Faith Brown) also function as stagehands, resetting the scene throughout the opera with their interpretative dancing. As we move into the 1930’s we meet Charlie, ably sung by Nicholas Ward, who tells us about the hard life he has in the Dust Bowl, and the impact of poverty facing many Americans at the time. One of the most poignant segments was about the “Yankee Comet”, a tanker filled with wide-eyed men delivering oil to wartime American Allies, only to be attacked by the enemy and lost in the Atlantic. A particularly interesting piece of orchestration came at the tail end of this sobering reflection of the perils of the war. Throughout the course of the opera, composer Chappell Kingsland had keenly incorporated musical styles and influences of the time period, but then I heard what sounded like a Pink Floyd guitar riff coming through – a little early for that influence, sir. However, the tone for the “Housewives of Essential Oil” was well put together. Save for some stilted choreography, the faux commercial presentation drew chuckles from the audience. Soon after, we were treated to projections that portrayed the flags of countries with an economic interest in oil. Dancers moved on stage seductively, which led into an aria that highlights several President’s views pertaining to oil, including: Nixon (Nicholas Ward), Ford (Matthew Peckham), Carter (Peter Morgan) and Reagan (Dylon Crain). While Mr. Peckham was having a little bit of an issue with his top notes, Mr. Ward and Mr. Morgan were elegant and strong. Perhaps the best of the quartet was Mr. Crain. Despite his youth, he has a tone and timbre that I hope I get a chance to experience again as he grows vocally. The vocalists/chorus took a break while they and the audience watched a slideshow of the beauty of the Earth and the devastation that Big Oil has left in its wake. While I appreciate the importance of the message, and the orchestration around it was lovely, it was stagnant and didn’t move the opera along. I believe that the librettist could have gone directly into the next scene, about the fires set in Kuwait at the end of Operation Desert Storm, and the environmental scar caused by the British Petroleum Company’s Deepwater Horizon oil rig disaster. In the end our lovely dancing America mimics taking a stand while Big Oil is positioned under a ladder. Soon choristers come out in different garb, representing different Americans: redneck, hippy, Millennial, hipster, etc., all singing “The American Way of Life is Non-negotiable”…. a quote from President George W. Bush. There are many important points, both positive and negative, contained within the song, but it was difficult to hear them all, as the orchestration often overwhelmed the vocals. It could also be that the octet seemed to be uncertain about this over-long song. In the end America and Oil walk seemingly into the Sunset, hand in hand. I do feel that the opera was too long. I realize that a lot of operas are well over 2 hours long, but there were several scenes in Intoxication that did not seem to propel the overall story. The orchestration and thoughtful libretto were indeed impressive. The talent on stage, although in need of additional grooming and experience, could very well be a new generation of memorable opera singers. Best wishes to Claire DiVizio on her success with Thompson Street Opera Company. CenterStage Gives Their Best to Tony-Award-Winning "Rent"